About Pacific Architectural Products, Portland, Oregon. Your Building Cladding Experts. Get more bang for your exterior panel buck. Since 1988, we have focused on creating aesthetically pleasing buildings that fit with your construction budget, and you can benefit from our extensive industry experience. 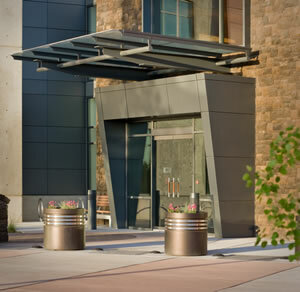 Pacific Architectural Products is more than a supplier and fabricator of cement panels, metal façade panels, and metal glazing infill panels for building exteriors. We are your panel guys, experts in budgeting, design and product knowledge. We understand your aesthetic needs, so our concern is your design and how we can make it a reality. At Pacific Architectural Products, we focus on providing you with quality, durable building panels that fit your budget and your design. We work with architects, general contractors and building owners to achieve the desired look for your school, office or retail building. This means being detail-oriented too. We can show you how to maximize those details for a more expensive look. As your expert panel guys, we know the products, we know the weather, we know what works. And we're innovators in our field, constantly on the lookout for other products that will help you create durable, attractive buildings. Like our fiber cement panels from Nichiha. Used in Japan and the USA for years, Nichiha fiber cement panels are now available on the west coast. Learn more about these exciting new exterior panels, or contact us with any questions. We also offer referrals to qualified installation teams, so you can rest assured your exterior panel system will be professionally installed for maximum effectiveness and durability. Come to Pacific Architectural Products for an exterior cladding solution that's aesthetically pleasing, durable and cost-effective. From fiber cement panels to a taut metal skin to glazing infill panels, Pacific Architectural Products has the product lines and project experience that's perfect for your building.